The European Associated Laboratory (LEA) entitled “Pulsed Electric Fields Applications in Biology and Medicine”, abbreviated as “LEA EBAM”, created in January 2011 for a term of four years, has been renewed for four more years. The purpose of the LEA is to carry out the research in the field of Electroporation in Biology and Medicine. LEA is a French-Slovenian “without walls” laboratory composed by French laboratories Vectorologie et thérapeutiques anticancéreuses (UMR8203), Institut de pharmacologie et de biologie structurale (IPBS -UMR5089), Laboratoire Structure et Réactivité des Systèmes Moléculaires Complexes (LSRSMC - UMR7565), XLIM Institute (UMR7252), the University of Ljubljana, the Institute of Oncology of Ljubljana and, since 2013, the University of Primorska. 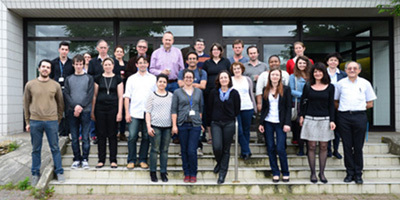 EBAM develops a multidisciplinary research, integrating biology, chemistry, physics, biophysics, mathematics, computational modelling and engineering, through the expertise of its members in order to fostering the efforts toward a better and safer implementation of the electropermeabilization-based applications, and to the development of new applications.